Cain playing for the Bears in 2014. Jeremy Robert Cain (born March 24, 1980) is a former American football long snapper. He was signed by the Chicago Bears as an undrafted free agent in 2004. He played college football at Massachusetts. Cain was also a member of the Philadelphia Eagles, Tennessee Titans, Washington Redskins, Jacksonville Jaguars and Tampa Bay Buccaneers. Cain attended Saint Thomas Aquinas High School (Fort Lauderdale, Florida) In football, as a senior, he garnered first team All-Broward County honors and All-State honors. Cain enjoyed a stellar career at UMass, seeing action in all four years of college at linebacker. A three-year starter, Cain was a two-time All-American and was also twice a finalist for the Buck Buchanan Award given annually to the top Defensive player in Division 1-AA. He finished his career ranking fifth in school history with 363 tackles. Cain was signed by the Bears as an undrafted free agent in 2004. He would spend the 2004 and 2005 seasons between the active roster and the practice squad. Cain saw action in eight games over two years and recorded 10 tackles as a reserve linebacker and one special teams tackle. In 2006 Cain spent the season with the Amsterdam Admirals of NFL Europe. He would serve as the team's starting linebacker and long snapper recording 38 tackles in helping the Admirals to an appearance in World Bowl XIV. For the 2007 season Cain signed as a free agent with the Philadelphia Eagles but was cut by the team in training camp. The following month he was signed by the Tennessee Titans after an injury to the team's long snapper Ken Amato. Cain appeared in nine games as the Titans primary long snapper and also made three special teams tackles. After spending the 2008 season out of football, Cain was signed by the Washington Redskins in 2009. He was waived on June 11, 2009 prior to training camp. Cain with the Jaguars in 2009. Cain was claimed off waivers by the Jacksonville Jaguars on June 18, 2009. Cain outlasted veteran Joe Zelenka for the starting long snapper position in the 2009 training camp. He would serve as the teams long snapper for all 16 games in 2009. Cain also made nine special teams tackles which placed him in second place on the Jaguars all time single season list for a long snapper. In 2010 Cain once again played all 16 games at long snapper and also recorded four special teams tackles. On February 24, 2011 Cain signed a three year, 2.45 million dollar contract with the Jaguars. In the Jaguars' Monday night loss to the San Diego Chargers on December 5, 2011, Cain's snap on a field goal attempt sailed to the right of holder Nick Harris, who chased the ball for 39 yards before recovering the ball on the Jaguars' own 31-yard line. 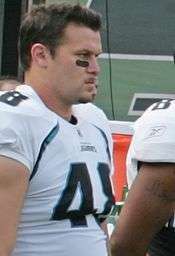 Cain was released by the Jaguars on August 25, 2013, after rookie Carson Tinker won the starting long snapper position. On November 6, 2013, Cain was signed by the Bears after Patrick Mannelly's injury. On November 19, Cain was released. On March 18, 2014, Cain agreed to a contract with the Tampa Bay Buccaneers. The Buccaneers released Cain on August 24, 2014. On September 1, 2014, Cain was re-signed by the Chicago Bears. ↑ Mayer, Larry. "Robinson, Forsey among Bears' final cuts". Chicagobears.com. Retrieved 2012-08-27. ↑ Gribble, Andrew (August 25, 2013). "Carson Tinker lone remaining long snapper on Jacksonville Jaguars' roster after Sunday cuts". AL.com. Retrieved August 26, 2013. ↑ Mullin, John (November 6, 2013). 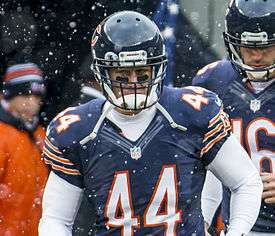 "Sick bay: Mannelly down, Bears sign new long snapper Cain". Comcast SportsNet Chicago. Retrieved November 6, 2013. ↑ Associated Press (November 19, 2013). "Bears waive snapper Jeremy Cain". The Charlotte Observer. Retrieved November 20, 2013. ↑ Alper, Josh. "Bucs sign long snapper Jeremy Cain". Pro Football Talk. Retrieved 18 March 2014. ↑ "Bears Sign Long Snapper Jeremy Cain, Announce 10 Practice Squad Signings". CBS Chicago. Retrieved 1 September 2014. Wikimedia Commons has media related to Jeremy Cain.